Another cold week ahead, as the January pattern will continue to hold for the next 4-5 days. 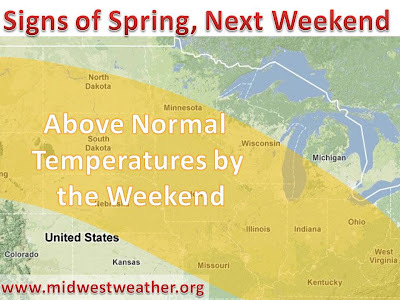 However, by the end of the week conditions look to favor for at least seasonable temperatures. We have been stuck in a pattern that was highly driven by strong high pressure blocking in the north Atlantic. 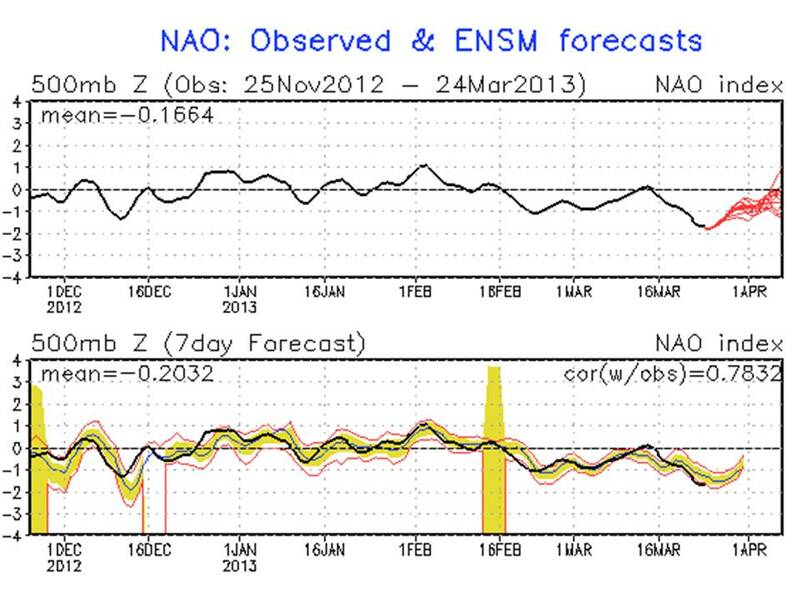 Notice the negative values on the NAO (north atlantic oscillation) chart below. 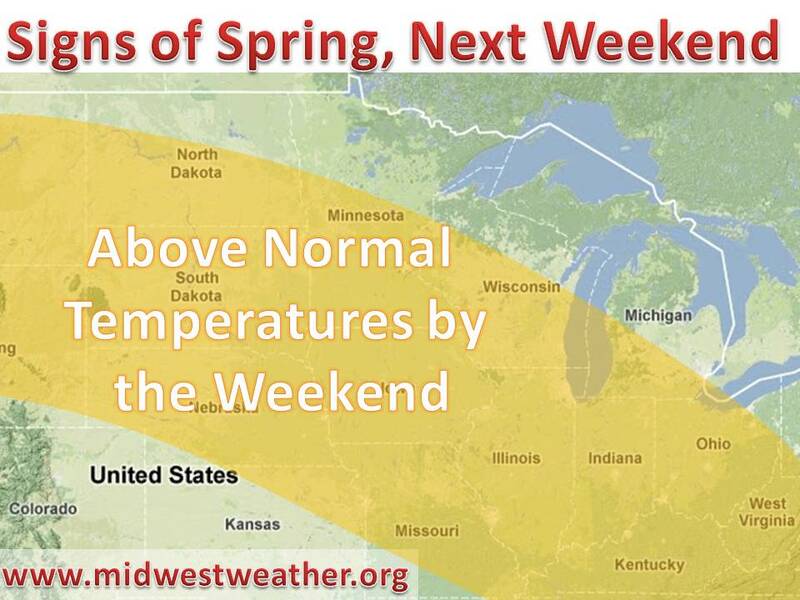 This usually means a stormy and cold pattern for the midwest and eastern coast. It appears that this index will go to neutral and many models are showing a warm up with a northern shift to the jet stream. Southerly winds will usher warm air north. Most areas will finally get above average for Saturday and Sunday. Not a major warm up, but it will feel relatively warm compared to recent weeks. Areas that just received heavy snow on Sunday will struggle to warm up with d snow cover, but with strong warm air advection temperatures just above average should still be expected. Early next week forecast gets a little iffy, some models showing another snow storm, some hold the warm air. We'll have to wait until we get closer. Once we get into late April long term prospects look favorable for a warm late spring and early summer. 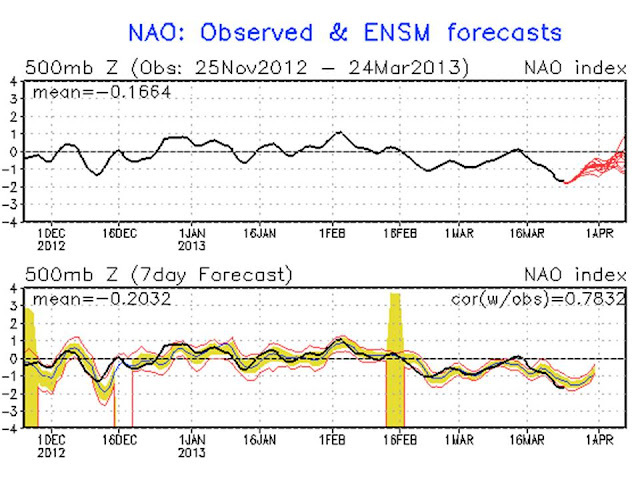 12z GSF model ensembles for NAO index, trend is upward.